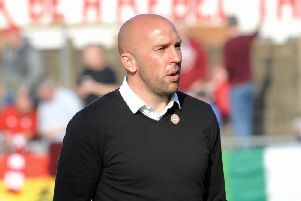 Adam Hinshelwood has outlined his plans for Worthing Football Club next season. Worthing ended the Bostik League Premier Division campaign in 16th as they were held to a 2-2 home draw by nine-man Brightlingsea Regent on Saturday. Despite what many would view as a successful season for Hinshelwood – who guided the Woodside Road outfit to safety after rejoining with the club rooted to the foot of the table back in September – the former Brighton & Hove Albion man felt they could have achieved a higher final league placing. He said: “I’m really proud of what the boys have been able to do this season. I took over with the team in real trouble but we did a good job to ensure our league status with games to spare. “There’s still plenty to improve on and the final game was another one in which we let things slip in the closing stages. Games and results like that one could be the difference between finishing mid-table or being up there challenging next season. I have ambitions, as do the club, to really push on. We don’t want to be fighting to stay in the division or stuck in mid-table, this is a club - particularly with the fan base and facilities - that should really be targeting National League level. Worthing were roared one by more than 1,000 supporters for their final game of the season at Woodside Road on Saturday. Fans continued to follow the team when Worthing were struggling at the start of the campaign and having to play games at rivals Bognor’s Nyewood Lane home. Worthing ended the campaign behind only champions Billericay Town and runners-up Dulwich Hamlet in terms of average home attendance this season.